Tickets and tables are on sale for the Humane Educational Society's annual "Rescues on the Runway," set for Saturday, March 16 at 6 p.m. at the Chattanooga Convention Center. "Sip on complimentary beer, wine and cocktails while sampling hors d’oeuvres of herbed cheese and sun-dried tomato tartlets; fresh mozzarella, tomato and basil brochettes; and vegetarian spring rolls, while bidding on an eclectic array of silent auction items," organizers said. "Guests will then enjoy a three-course meal of Mediterranean salad, chicken saltimbocca served with orzo primavera and seasonal vegetables (or enjoy a vegetarian option of butternut squash ravioli in sage butter with assorted grilled vegetables). Dessert will feature a decadent chocolate torte or a fresh strawberry and white chocolate mousse parfait. "Dinner will be followed by Chattanooga’s most unique runway show, which features touching stories of former shelter pets who have found their forever homes, as well as some great companions who are available for adoption. 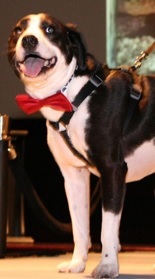 "During the runway show bid on fantastic live-auction items to make a difference for homeless animals in our community. "Be sure to stay for the after-party and dance the night away."